The British Museum is located in the heart of London and is considered one of the UK’s national treasures. It houses a vast collection of antiquities that visitors couldn’t possibly hope to cover in all in one day. The pieces range from the Rosetta Stone to a Samurai warrior’s armour, Parthenon sculptures and an Easter Island statue. 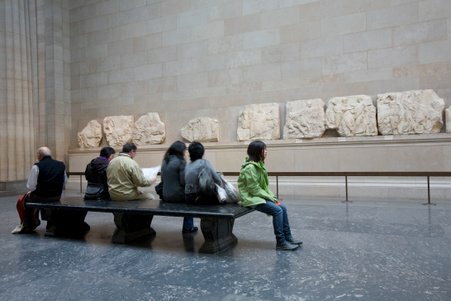 A great way to get started in the British Museum is to take one of the free ‘Eye Opener’ tours. These only take around 30 to 45 minutes and with 15 different options to choose from you are certain to find one, if not more, that appeals. You meet in the relevant rooms and the guides will introduce you to the pieces in a lively and informative way. They also offer free gallery talks from Tuesdays to Fridays (approx. 45 minutes) where a member of staff from the museum or a guest speaker gives insight on their specific topic. You don’t need to book – you just drop in. If you are quite an independent traveller and prefer to discover things for yourself then when you enter the museum collect a guide and map (audio guides are also available). This will help you to orientate your way around the vast collection and you can focus on the sections that interest you the most. It is a good idea to plan a little bit in advance before going to the British Museum, especially if you’re short of time, because there really is so much to see. The British Museum, like so many others, runs special exhibitions (the current one focussing on Pompeii and Herculaneum). These can get a little bit busier than the resident exhibitions so it is best to book online and early. The prices vary for these but they’re always worthwhile. The museum is a family focused environment with free activity trails and backpacks to engage children’s imaginations. For those who enjoy crafts, visit the Families Desk to borrow crayons, pencils and pads and let little ones enjoy re-creating what they have seen. The museum puts on lots of interactive family events during the holidays, which are very often free. Check on the website to see what is going on before you visit. A number of the galleries in the British Museum remain open late on Friday nights, and on some occasions there will be musical performances to enhance the experience for visitors. The museum is often quieter during these times as there won’t be any large school parties filling the halls, so visitors can enjoy the exhibits in more tranquil surroundings. It may not be the most famous of museums in London, but it has plenty to interest the thousands of visitors that walk through its doors very week. Download the British museum app on your phone – it has the tours and all the information you could possibly want on it – helping you to make the most of your visit. The easiest way to get to the Museum is by Tube. Nearest stations are: Tottenham Court Road, Holborn, and Russell Square.